Asked if his mother supported his decision to push for a divorce, the lawmaker gave a cryptic reply. Bihar lawmaker Tej Pratap Yadav, who remained aloof after announcing his divorce two months ago, today met his mother, former chief minister Rabri Devi, on her 63rd birthday, at the residence of his younger brother Tejashwi Yadav. Asked if his mother supported his decision to push for a divorce, the lawmaker gave a cryptic reply. "She is with me in all my battles," he said. 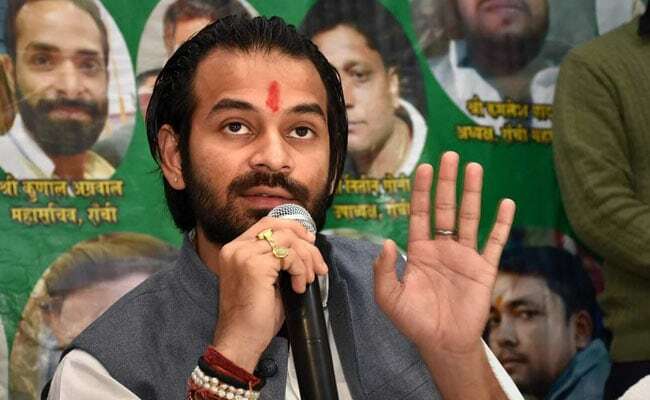 Tej Pratap Yadav, who got married seven months ago, had announced his decision to divorce his wife Aishwarya Rai in November. His father, RJD chief Lalu Yadav, and his mother were reportedly not happy with his decision and wanted him to patch-up with his wife. He left on a pilgrimage, saying he would not return until he gets the support of his parents. He recently returned from his over a month-long hiatus and met his jailed father. After the meeting, he has been involving himself in party affairs with an intensity previously unseen. He staged a demonstration in front of a police station last week, accusing the inspector in-charge of misbehaving with him over the phone over his demand of filing an FIR, based on the complaint of a woman living in the area. After the meeting with his mother today, Tej Pratap said: "I have already received the 'ashirwad' (blessing) of my father. I am happy that my mother has also blessed me on her birthday". There have been reports of rift between Tej Pratap and Tejashwi Yadav. When Tej Pratap went to his residence to meet Rabri Devi, his younger brother was in the national capital. When asked if his absence was an indication of rift, he said, "I hereby say Tejashwi is going to be the next chief minister of Bihar." Last month, Tej Pratap, a legislator from Mahua in Vaishali district, avoided crossing paths with Tejashwi Yadav, who is the Leader of the Opposition, as well as mother Rabri Devi, signalling disquiet in the family over the divorce issue. Tejashwi Yadav is widely seen as RJD chief Lalu Yadav's political successor. Lalu Yadav is currently serving sentences in a number of fodder scam cases.